New 'Merchant Of Venice' Recasts Shylock As A Sympathetic Everyman Actor Jonathan Pryce is playing the Jewish moneylender in a new touring production of The Merchant of Venice that reimagines Shakespeare's supposedly-comic villain as a tragic and universal figure. 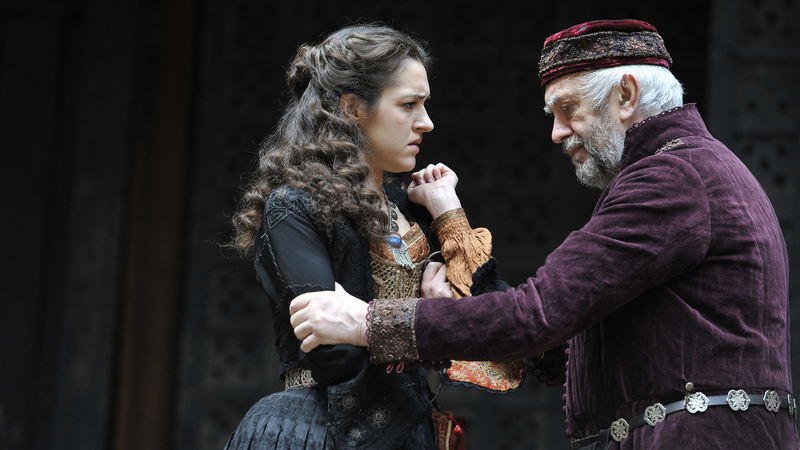 Real life father and daughter Jonathan and Phoebe Pryce as Shakespeare's Jewish moneylender Shylock and his daughter Jessica, in a new production of The Merchant of Venice. Shakespeare's play The Merchant of Venice is a troubling comedy. The play's villain is Shylock, a Jewish moneylender. He gives one of his Christian tormentors a loan on the condition that if the merchant doesn't repay, Shylock gets a pound of the borrower's flesh. While Shylock does give a famous speech that nobly decries de-humanization of the Jews, the play is full of anti-Semitic language and ideas. Shakespeare's Globe Theatre has a production of The Merchant of Venice on tour. It's in Washington, D.C. right now, and it's gotten good reviews, especially for actor Jonathan Pryce, who plays Shylock. It's his first time in the role; he tells NPR's Robert Siegel that he never thought he'd play Shylock. "I never thought I would be appearing at all in The Merchant of Venice. It's a play I've never in the past liked, and when they asked me, from the Globe last year if I wanted to do it, my immediate reaction was no." I see Shylock in 2016 as a kind of Everyman figure. He's every immigrant, he's every person who's trying to escape. And it becomes a very universal piece — otherwise, I don't think it's palatable. I've never liked it. I had always considered it to be a racist play, an offensive play. It's billed as a comedy, I always thought it wasn't particularly funny. So I said no, and immediately regretted it ... I asked for time to re-read it, and reading it from Shylock's point of view, thinking I would play Shylock, and also reading it in 2015, the political situation in the world today, the fear of the alien, fear of the immigrant — it became a became a very relevant piece, and it has huge resonances and echoes of what's happening today. What ... our director wanted to do was to bring out the, and to emphasize the storyline of Jessica, Shylock's daughter, who leaves the household; she says "This house is hell," and she goes and marries a Christian, taking all of Shylock's money. What it does, it gives them a context ... it's very often the case the person who's abused becomes the abuser and he's very controlling of his daughter and I think that's also what we wanted to emphasize, that Shylock is a human being who has been constantly abused, then reviled and spat upon and treated badly, so you see, it gives him a reason to do what he did. So what we wanted to do was to have that scene, that father and daughter scene — ironically, played by a real father and daughter, that's my daughter, playing my daughter. The production tries to humanize him. I mean, you introduced him as the villain of the piece — I do not see him as the villain of the piece at all. But I see Shylock in 2016 as a kind of Everyman figure. He's every immigrant, he's every person who's trying to escape. And it becomes a very universal piece — otherwise, I don't think it's palatable.